Here’s an early look at my long planned composite piece, “Burren symphony”. That’s the working title, ha. The idea came to me while I tiptoed through Burren meadows and watched in amazement as dozens of wildflowers—all sizes and colors— waved in the breeze and happily mingled together. It’s quite a sight. Anyway, this is the first rendition, me trying to work out a decent composition. Much more thinking and looking to come. A couple more redraws too. It’s still my favorite part of the process—just a pencil, paper and eraser. The plan is to complete a graphite version and a color pencil/watercolor version. Yeah, this could take awhile. The roster currently includes Mountain Avens, Bloody Cranesbill, Oxeye daisies, Harebells, and a couple of orchids. It will evolve. So here’s where I’m at after several months of grinding away daily. Don’t look too closely, these are all about 70 percent finished. But now is a pretty good time to put everything together to see what they all look like as a body of work. I have a couple more still to do, and I’ll keep moving around from plate to plate, pushing and pulling, trying to drag them all across the finish line. I will also soon seek professional help—in the form of critiques at the Denver Botanic Gardens. I am still aiming at being finished by the beginning of summer 2017. We’ll see. I start teaching on Tuesday and that will definitely add to the chaos! Just a few thoughts on the world of competitions and exhibits. There is, of course, a powerful allure to having ones work shown in public. The ego wants what it wants! But I’ve also come to realize how dangerous and fleeting that can be for one’s development as an artist. I admit I’m guilty of creating work solely in the hopes of getting into some show. I’m elated when my work gets in, I’m crushed when it does not. The first piece I ever did got accepted to an exhibit and sold the first night. I thought I was pretty hot stuff even though, in retrospect, I really didn’t know at all what I was doing. It has not happened again since. That’s serendipity. But being on that roller coaster quickly becomes distracting and tiresome. I’ve come to learn that working with a purpose and with a passion for a subject is much more fulfilling even if that work is never widely seen by the public. It doesn’t mean the work isn’t good—or worthwhile. I think doing meaningful and personal work is the best way to grow. On the other hand, I’ll take serendipity when I can get it. 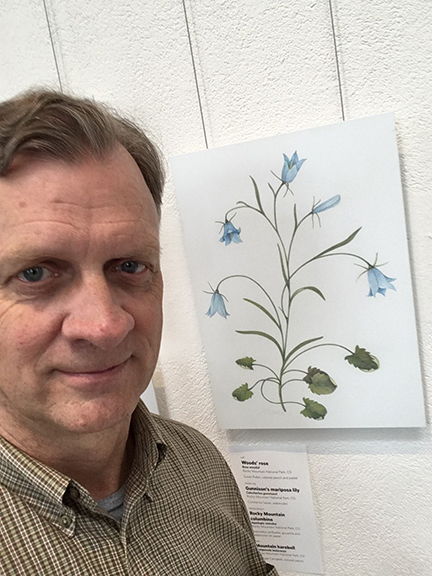 I just recently realized that I have —for this one month only— a piece hanging in the U.S. National Botanic Gardens in Washington D. C. and a piece on display at the National Botanic Gardens in Dublin, Ireland, at the same time. Now that’s definitely serendipity! At the opening in the National Botanic Gardens. So, what does one do when things get a bit dodgy at home? Dublin of course. And so, I took off for the Plandaí Oidhreachta— Irish Heritage Plants— exhibit opening on the day of upheaval here in the states. What a wonderful way to decompress and submerge, surrounded by creative and like-minded people. The opening of the exhibit was a big hit, very crowded, noisy, and festive. The work on display was astounding. The talent level in Ireland is off the charts and I was truly humbled to be allowed in the same room with these folks. The big takeaway for me was that I really need to step my game up. 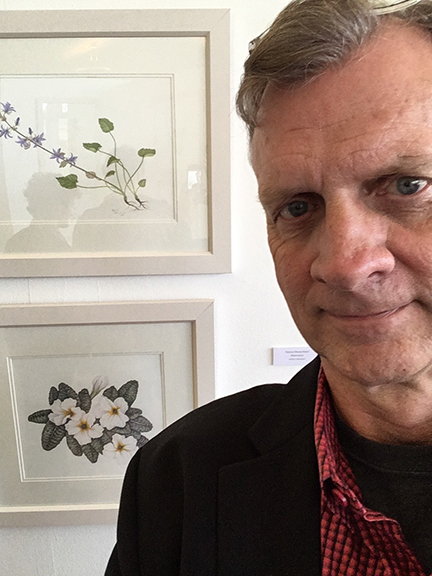 These artists are very serious about the work and tradition of botanical art. To stay with them I’ll really have to rededicate myself in the coming year. And so I will. Anyway, had a memorable four days in a remarkable, bustling city teeming with youth, energy and optimism. Just the kind of shot in the arm I needed. This little gem came in the mail today, what a nice surprise! Pentagram, the best and most accessible design firm in the world, occasionally sends out gifts in the form of their “Pentagram Papers” series. These are projects they create because they find the stories interesting—plus they are dynamite marketing tools. Nobody does this better. Anyway, this is the story of Marie Luise “Agnes” Leibbrand from Stuttgart, Germany, who between 1876-1890 collected flower samples on her many travels throughout Europe. When her clippings of wildflowers, leaves and ferns were still fresh and free from dew, Agnes would press them between volumes of books or with a special field press. Once dry, Agnes bound them into neat arrangements and fixed the blooms to a piece of card or unfolded envelope, meticulously labelling each one with a number, date, and description of origin. Agnes produced 42 of these pressings, weaving Europe’s natural history with her own more personal one. This small publication beautifully shows us each one. This is what great design can do. Thanks to DJ Stout at Pentagram Austin for keeping me on their list. I treasure each and every one of these. Here is a brief sequence that hopefully illustrates the concept of bringing a drawing/painting “into focus”. First of course, is the pencil drawing which is transferred to Fabriano hot press paper. Then I begin to lightly—very lightly— lay down layers of color, paying close attention to how light hits the forms. Image number three is about six hours in, I’m still slowly applying color layers. This piece is about 40 percent done, still a long way to go. More work on lights and darks, adding leaves and grasses in the foreground, and tons of sharpening and burnishing. 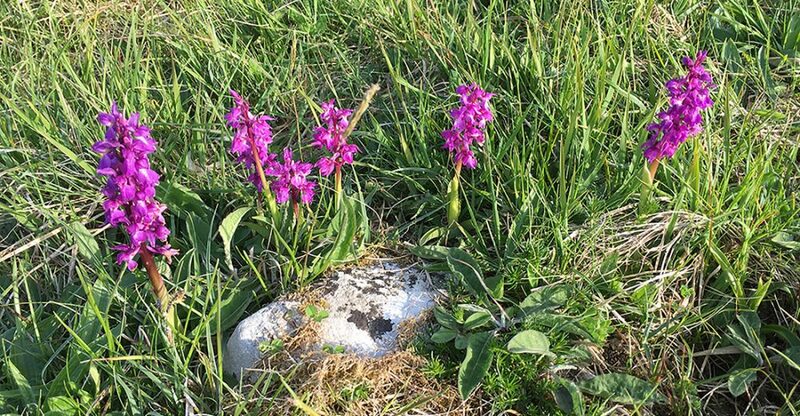 In the middle: a pyramidal orchid (Anacamptis pyramidalis) with two common fragrant orchids (Gymnadenia conopsea) on either side. It is quite difficult to tell these two orchids apart in the field. Here is the very beginnings of color layering on the Harebells (Campanula rotundifolia). One important thing I have learned at SBAI is that color pencil drawings\paintings slowly—and I mean slowly— come into focus. After creating various color test swatches I start to lay down very light layers of color—blues, yellows, violets, and greens, and with every additional layer I begin to gradually sharpen the image. It takes patience, without worrying about how clunky the early image looks. Eventually I will switch to Verithins, which have much harder leads and much sharper points. I usually end the process with a 2H graphite pencil to really sharpen edges and deepen the darks. Slowly . . . I’ll follow up as I get further on down the road. Work in progress. My continued fascination with the interaction of flora and stone. Sea bindweed, which grows in the sand on beaches and dunes along the Wild Atlantic Way.